Spread out over 85 square miles, Wicklow Mountains National Park is a natural wonderland of craggy hills, wild bogland, glacial valleys and windswept heath. The raw natural beauty of the Wicklow Mountains is all the more striking when considering how close the outdoor escape is to Dublin. The area is sometimes known as Irish Hollywood because many of the Emerald Isle’s most famous citizens have homes in the untamed countryside. Bono, Daniel Day-Lewis and most famously, the Guinness Family, all have property near the beautiful Wicklow Mountains. However, the most stunning landscape of all is found within the protected Wicklow Mountains National Park. Here is your complete guide to what to see and where to stay on your next visit. The Wicklow Mountains have provided a backdrop for some of the most widely watched films set in Ireland, including "P.S. I Love You" and the TV series "Vikings." There are numerous walking trails, as well as medieval ruins and breathtaking vistas. To really see the entire mountain range, the best thing to do is to walk the Wicklow Way. The 81-mile trail can take five to seven days to complete so the full walk is usually only undertaken by serious hikers. However, you can jump on the trail at various points inside the Wicklow Mountains National Park. 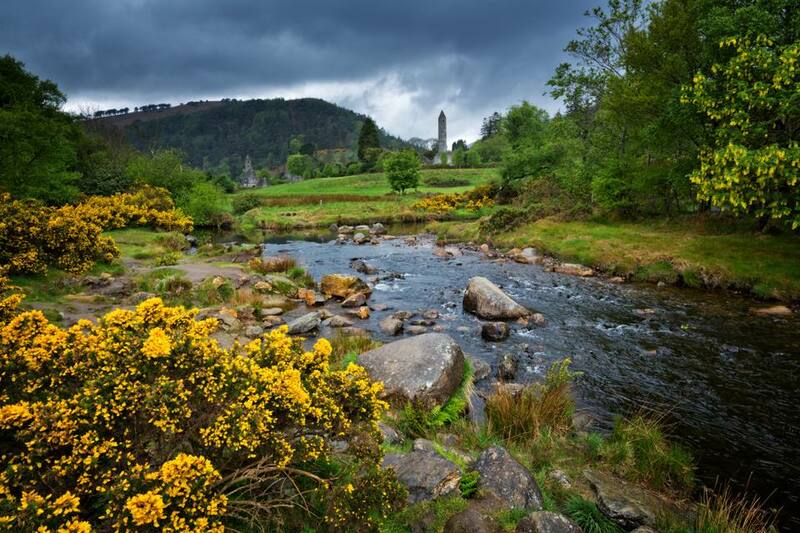 The most popular stop in Wicklow Mountains National Park (and one of the top places to see in Ireland in general) is the Monastic City at Glendalough. Set in what is known as the valley of the lakes, the early Christian site was founded by Saint Kevin in the sixth century. Here you will find the ruins of a cathedral and an impressive Irish round tower. Sally Gap is one of the two east-to-west passes in the Wicklow Mountains. Taking R759 there is often called one of the best drives in Ireland. It is often known as the Military Road because it was originally built by British Forces in order to keep rebels out of the nearby hillsides. The views look out over bogs towards the mountains. A popular stop along the way is at Glenmacnass waterfall near the village of Laragh. Those seeking the highest mountain should mark the map to head to Lugnaquilla, which is the tallest mountain in the Wicklow range with an elevation of 3,035 feet. It stands next to Glenmalure, the longest glacial valley in Ireland. Finally, though it technically lies just outside the park, the Glencree German cemetery is a must-see stop for many visitors. It is Ireland’s only German cemetery and has several World War II-era graves, including the final resting place of a former spy. Wicklow Mountain National Park is an easy drive from Dublin. Those who want to have the flexibility to take longer hill walks and explore most of the natural wonders inside the park should drive themselves. Simply follow the R747 towards Avoca and let the sightseeing begin. We recommend following this self-driving tour of the Wicklow Mountains. However, if you are short on time and mainly want to hit the major spots, then there are several tour companies offering day trips from Dublin. Some companies also offer extended tours which allow for time to add on two-hour hikes and even horseback riding. The most famous accommodation near the Wicklow Mountains National Park is the Glendalough Hotel. The historic hotel dates back to the 1830s and is a short walk from the Monastic City. The Glenmalure Lodge is a comfortable family-run B&B set in a glacial valley that provides easy access to many nature walks. There are also several B&B options in the village of Laragh. Wicklow Mountains National Park is primarily a wilderness area and there are limited facilities. You can find parking lots at the visitor center and Upper Lake in Glendalough. Otherwise, parking inside of the National Park is limited to small turnoffs near the main roads. There are only two public restrooms inside the park—at the OPW Visitor Center and the Upper Lake parking lot. The best dining options are in the towns that border the park rather than inside it. However, there is a stall selling snacks in Glendalough near the Monastic City during peak season. For a meditative break, stop in Victor’s Way on the old Enniskerry Road. The wooded park is full of Indian-inspired sculptures that were placed in the Irish countryside by a Berlin-born Buddhist monk. This park does not permit children. For a family-friendly day out, the Greenan Maze is a fun stop in Ballinanty to get lost in a manicured labyrinth made of plants and hedges. After wandering through the maze, there are farm animals to see and small café for lunch.